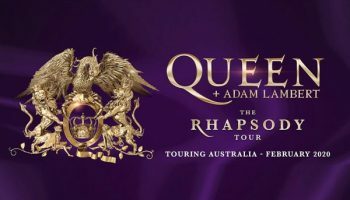 ‘Bohemian Rhapsody’ Movie Review – Spotlight Report "The Best Entertainment Website in Oz"
Bohemian Rhapsody is that most awkward of cinematic beasts: a curate’s egg. 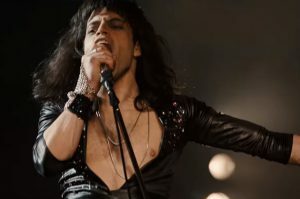 It tells the story of Queen in a stodgy, overly-reverent fashion, but Rami Malek‘s performance as Freddie Mercury is so good that it’s got to be seen to be believed. 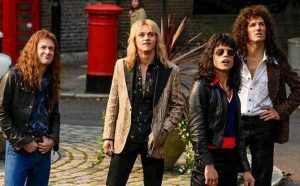 Directed by Bryan Singer (and finished by Dexter Fletcher in an apparently tumultuous production), the film follows the history of the band in a completely linear (if not entirely truthful) fashion, from a revisionist first meeting of a young baggage handler Farrokh “Freddie” Bulsara with guitarist Brian May (Gwilym Lee) and drummer Roger Taylor (Ben Hardy), adding bassist John Deacon (Joseph Mazzello) and following their rise to superstardom. Through a succession of managers and lawyers, the y get their first TV performance and then the freedom to record A Night at the Opera. This leads to a (mildly) amusing (fictional) scene with Mike Myers (of Wayne’s World) as a record executive disparaging the song Bohemian Rhapsody. The film covers Mercury’s split with the band, his long relationship with Mary Austin (Lucy Boynton), his coming to terms with his sexuality, and his reunion with the band before ending on their legendary Live Aid performance and his partnership with Jim Hutton (Aaron McCusker). There’s not much in terms of insight into the band, and the other members are treated largely as ciphers to be derided by Mercury in a queenish fit of pique and then happily reconciled with. It’s much more fun seeing the mythologising of their creative process, and it’s hard not wishing there’d been more of that on screen. Queen were a band that earned their success through hard work and inventiveness, and despite the supernatural gifts of Mercury’s vocals and May’s guitar prowess, the film makes it all look a little too easy. One part of the film that really hit a bum note was the depiction of Mercury’s growing sexual wildness as a sort of moral descent into a Stygian, leatherboy abyss, with the reckoning being his contracting of HIV. It’s fair to say that Mercury was indeed sexually and chemically wild and that’s how how he was infected, but there’s an element of cautionary fingerwagging here that’s a throwback to a an older era. Plenty of careful, well-behaved gay and straight people were infected too. Where the film really sings is its depiction of Mercury’s liberation from his insecurities on stage. Mercury was a man from a conservative Zoroastrian background who kept many secrets from his family, his friends and the public, and the one place he let everything go was on stage. Malek‘s transformation into Mercury here is so good that it verges on the uncanny. Some trickery was used to enhance his singing, but that’s fair enough considering literally nobody can sing like Freddie Mercury. Malek masters Mercury’s body language, his mannerisms and stage moves perfectly. 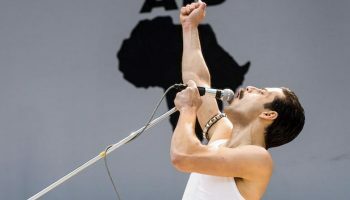 This really pays off in the film’s climax, a nearly complete rendition of Queen’s legendary Live Aid performance at Wembley stadium. 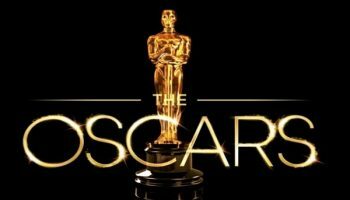 The effects used to replicate the vast audience are really quite bad, but in a big cinema with powerful sound the scene is still triumphant and electrifying and drew applause at our screening. But there’s a bit of a fib being told here. Mercury’s diagnosis, in reality, was two years after the concert, and so the timeline here is being fudged to add impact to the story. This sort of liberty is taken throughout the film, and so I’d recommend reading a little more on the history of the band to get the real story. If you’re a Queen fan, you’ll see this, and if you’re not a Queen fan there’s a good chance you’ll become one after seeing it. This is a hokey, sentimental sort of film and there’s nothing profound or particularly informative or insightful about it but the music is great, the visuals are lush, and Malek deserves awards. You might roll your eyes occasionally, but you’ll be having a good time.